A plant manager walks through the production facility. He sees an employee performing a maintenance task on a machine. Has this employee been trained for this task? A forklift drives past. Does the driver have the right qualifications and are these still valid? A gauge is calibrated, an incoming goods inspection is performed, or an initial sample test report is formulated. Are all the necessary qualifications for these tasks available and up to date? And, while we’re at it, have all employees received adequate safety training? How can one most easily manage and monitor all said information? This is where Qualify.Net training management software comes into play. It provides an overview of all trainings and qualifications in the company and thus provides quick and simple answers to all training-related questions that arise in practice. As if the aforementioned reasons were not enough, a whole host of standards and regulations demand that you are able to prove that your trainings and qualifications are up-to-date. One, however, doesn’t have to be active in the strictly regulated medical device industry in order to come into contact with the legal necessities of training management. Simply being able to provide evidence regarding an employee’s driving qualification or the attendance of annual safety instructions can quickly create legal liability issues if the necessary documentation is not managed correctly. Lastly it is also the customer who plays a part in this circle of requirements. It may very well be that a customer requires that his suppliers practice effective training management in order for him to be able to meet his own compliance guidelines. Who knows, maybe the reason that a contract is not rewarded therefore actually lies in the fact that one’s trainings are not managed and documented correctly? How Can Training Management Software Help? The Qualify.Net training management software supports you during the planning, execution, and documentation of all training-relevant matters in your company. Apart from assisting during the documentation of all existing qualifications and planning of future employee trainings, it is primarily the consistent target/actual comparison regarding required and available qualifications that provides a significant reduction of the training-related workload. Qualify.Net also allows you to unveil the often hidden potential of your employees. 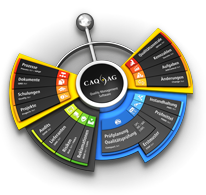 Regardless of whether you wish to establish and monitor the training and qualification requirements in your company or find the perfect employee for a given task: the comprehensive list of functions, logical layout, and high degree of usability make Qualify.Net the definitive tool for managing and documenting all training and qualification matters in your company. The qualification matrix in the software allows you to, for instance, precisely trace which employee requires training in which area and at what point in time said training is due. This means you can consistently monitor and document any type of training and qualification – regardless of whether you are dealing with safety trainings, language tuitions, technical schoolings, or any other type of training. Just a few clicks allow you to fulfil key documentation duties within the framework of ISO 9001 Chapter 6.2 and create an expressive and easily maintainable qualification and training database. The matrix also allows you to always find the most suitable employee for a specific task. Let´s say you are, for example, looking for an employee in your company who has a truck driver’s license, speaks fluent German, and has been trained in the handling of dangerous goods. All you need to do now is enter these parameters and the system will return a list of candidates along with information that states to what degree the individual candidates fulfil the required qualifications. In our example, you may learn that seven of your employees have a truck driver’s license and are trained in the handling of dangerous goods, but only one of these seven also speaks fluent German. In just a few steps, the software thereby allows you to find the most suitable employee for any given task. All training management functions that Qualify.Net has to offer are, of course, seamlessly integrated into the entire CAQ.Net® software family. This means that if you e.g. create or edit a standard operating procedure in the document management module QBD.Net, the system will automatically adjust the company-wide training requirements accordingly and notify all affected employees. And the task management module JobControl.Net will, for instance, send invitations to the relevant employees and ensure their attendance by reminding them within fixed time intervals. Along with the verification of the actual qualification, the software will also provide a verification of training effectiveness. After successful participation, you will receive verifications regarding the employee training including an evaluation of the training participants and the training instructor. The software will also inform you of necessary employee re-qualifications in advance. All training-relevant objects, certificates, or documents can be easily attached to the training profile of each individual employee. The software provides an online training catalogue with which your employees can register for a training event directly via the web or send questions to the department responsible for trainings in your company. This comprehensive training query management also allows you to precisely define what trainings may be booked and attended by what persons, specify what maximum number of participants shall not be exceeded in a given training, and determine whether or not the system may automatically accept participants for a training event.